Tuesday - Friday: 11:00 AM - 3:00 PM, Saturday - Sunday: 11:30 AM - 3:00 PM. Tuesday - Friday: 11:00 AM - 2:30 PM. Tuesday - Thursday: 3:00 PM - 9:00 PM, Friday - Saturday: 3:00 PM - 9:30 PM, Sunday: 3:00 PM - 8:30 PM. 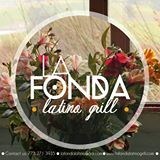 Welcome to La Fonda Latino Grill, where you can find traditional Colombian food and a touch of Latin American food. We are located 10 minutes north of downtown, in Andersonville. A full bar service is also available to accompany your meal with a variety of cocktails to a list of wines to choose from. Catering options are also available or let us host your special occasion of up to 75 people. Come join us with your family, friends or that special person and have a memorable experience.